How to make your website stickier. We’ve recently tweaked our websites and blogs to encourage people to spend more time on them, to make them “stickier”. Why does that matter? For a few reasons. Let’s start with the basic notion that a website should provide a good user experience. Great content, easy to navigate, fun and/or useful. These are hallmarks of a good website. If your website delivers, visitors will want to stick around. Your website will be “sticky”. Search engines reward websites that contain these characteristics? Why? Search engines want to deliver results to searchers that are meaningful and valuable. What are meaningful, valuable results? Websites that have excellent content, are easy navigable, and provide the content the searcher is looking for, perhaps in an entertaining way. What are some indicia to a search engine of a good website? Lots of visitors, visitors that visit multiple pages, visitors that stay on your site for a while rather than “bouncing” to the next one. You can see the cycle. So what are the very simple tweaks we deployed to make our site “stickier”? We use the Jetpack plugin built by the same people who built WordPress. Not everyone likes the plugin. Some feel it’s bloated. We figure the people who develop WordPress have some good ideas about what WordPress plugins ought to do. The Jetpack plugin offers a sidebar widget that will post whichever posts and pages are trending as the most popular on your site. Did you just post a video about a cat riding on a pony? Chances are people are checking that one out. But maybe someone else visited your site because they were looking for alternative ways to tie shoes and you have a spot-on post. But maybe once there, they’d like to know what everyone else visiting your site is reading. We think there’s a bit of human nature there: we like to know what others find so interesting. So now, shoelaces visitor, who otherwise might only have visited that one page, has now visited two, has spent more time on your site, and may just share that cat on a pony video with someone else. This one is killer and, by gum, a no-brainer. This plugin hands relevant, useful content to your visitors on a platter. Here’s what the plugin does. It adds at the bottom of a post links to content on your site that is related to the post. Check out, for instance, the related posts at the bottom of this article. So you wrote about shoelace tying. Maybe you also wrote another post about shoe buckles, and another about knot tying generally. (It’s the beauty of the web, baby. You can blog about anything.) The plugin will identify posts that are contextually similar and group them together. Your visitor now has the opportunity to read additional posts on your blog that are similar to the post they initially found.How many times have you found yourself surfing the web and following a trail of somewhat related information? Every day, right? Well why not help your visitors to do that while keeping them on your site? In this way, the visitor spends more time on your site visiting more pages. You’ve just made a visitor happier, and your site stickier, and now you’re getting more search engine love. What tips do you have for making a website stickier? Leave a comment below. 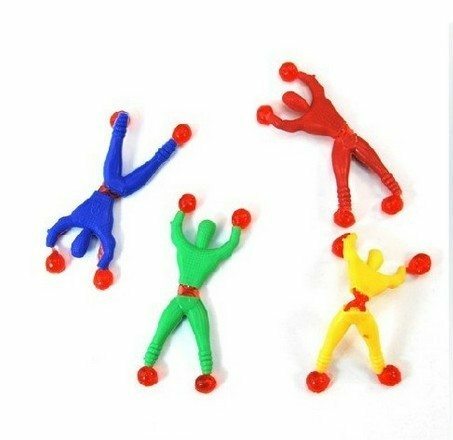 Photo credit: Sticky Wall Walkers, Window Crawler, Tumbling men by huayiinc, on Flickr. Used with Creative Commons license. We can help you to create a website people want to visit. Please check my blog and give me instruction for more visitors!!! Take a look at the suggestions on this website and elsewhere and I’m sure you’ll have no problem. Generally speaking, posting on a blog simply to get a link back to your website, however, is considered poor form. A very useful post, Cliff! After reading it, I went back in and added links to posts I referred to in the text of my current blog anniversary post. I might get the plug-in for the related posts (though the more useful one for me is the one for the popular posts) and in any case will pay attention to related posts that may be of interest to readers of my current one. Sometimes the “Related Posts” I’ve seen on other sites have taken me to places I don’t think are related at all, which is kind of disappointing. Thanks, Lyn. Adding related posts manually works, too, though it’s pretty time consuming. I feel like I’ve had pretty good luck with YARPP identifying authentically related posts and pages. You can also limit the number of related posts/pages. The plugin places what it determines to be the most related content first.